Pablo: Oh great, now that JJ's let the cat out of they bag, I can debunk this ridiculous theory once and for all too. @Gemini wrote: I know his statement is damage control but im just p***** now..sorry..Im angry at him, he should have just left it be. I don't know. Maybe he didn't really have an option legally. Or professionally. Disney is powerful, so powerful. He got a phone call. @Mana wrote: Pablo: Oh great, now that JJ's let the cat out of they bag, I can debunk this ridiculous theory once and for all too. Don't worry, Rey Skywalker supporters understand PH words in a way that doesn't debunk their theory. No problems. Prepare for a Pablo tweet with the same tune. That's next. Guys, I expected some kind of retraction but I'm shocked how laughably bad this one is. he isn't even trying. It's as if Disney told him he had to say anything and he did just that, said anything. It's a bad DC statement. He wasn't misquoted. He was caught on camera. Everyone can hear what he said. Moreover, PH obviously thought was OK to support his quote as "they are not in TFA". So miscommunication. PH didn't get the memo on time. It's a clusterf*** that this half-a**ed DC statement confirms 100%.It's a bad unconvincing spin on his genuine words when he was caught off guard and couldn't think up some BS answer. He likely didn't have any other choice. When things go viral, damage control often has to be done. @AnneNeville is probably right, this was likely about him getting in trouble with those at the top. It's a tricky business. This is no different from Boyega going back on debunking Stormpilot. Not long after Boyega said Finn and Poe was just a bromance, the higher-ups decided it made them look bad, so they opted to have JJ and Boyega make statements about how there would be gay characters in Star Wars. It didn't mean Finn and Poe would be those gay characters. Boyega also said that he "didn't know what the script for Episode IX" would be like, so he he "couldn't say if Stormpilot could or couldn't happen." This was the same kind of damage control, but both statements are essentially meaningless and in no way alter the original statements. Finn and Poe is just a "bromance" and Rey's parents weren't in The Force Awakens. Pablo managed to support what JJ said without outright confirming it because he is really, really good at this game and I have to say that I respect that. And he gave us the "Kylo is the Skywalker in TFA" statement, too. Poor Pablo there's no going back from this, the internet is written in permanent ink. But really there's nothing he could do, after all it's JJ himself who started it. They were never going to debunk Rey Skywalker openly. I was shocked when it happened today and expected some DC which happened, as Fizz said, same statement but rehearsed. But nothign changes the fact that he said it and it was followed by PH tweets. It doesn't amtter what Rey Skywalker camp believes. You be the judge based on JJ's unrehersed statement, PH tweets and JJ rehearsed statement. I think that they are sick of this but higher ups want it kept under the wraps. But annoyance seeps through. First DR, now JJ, PH was losing patience for months already. basically, they all say she is not without actually saying...except that JJ actually said it. Lol,poor gullible Rey Skywalker fabs they've already fallen for this damage control crap and believe JJ made a genuine mistake because there's no way Rey's not a Skywalker.Yeah,right.There's also the tiny matter if Pablo debunking Rey Skywalker as well but he's just a troll so who cares. This is such a mess,seriously. @Xylo Ren wrote: Prepare for a Pablo tweet with the same tune. That's next. Pablo didn't say anything too bad, certainly not as bad as JJ himself. He's careful like that. Instead of saying "He's right, Rey isn't a Skywalker" he says "People on the internet have made up their minds about Rey, so nothing will stop the debates. Rey is Rey". We can all see that he meant the former, but people could explain away the latter by saying he's stating the obvious or trolling. The same goes for "Kylo is the Skywalker in The Force Awakens". Well yes, of course he is. It's a wake-up call people seriously needed to hear regardless of any Rey Skywalker debunking, but one could argue that it doesn't say anything about Rey. I think Pablo's safe. He knows how to word his Tweets. It isn't new, but it's pertinent. can we all agree that JJ's DC is one of the worst in history of bad DC? Because what he said was so unrefutable that they couldn't come up with anything. Yeah, I want to say I could have lived without this entire debacle tonight, but the other part tells me it was a sincere gaffe and we still should be celebrating like the "clarification" never happened. 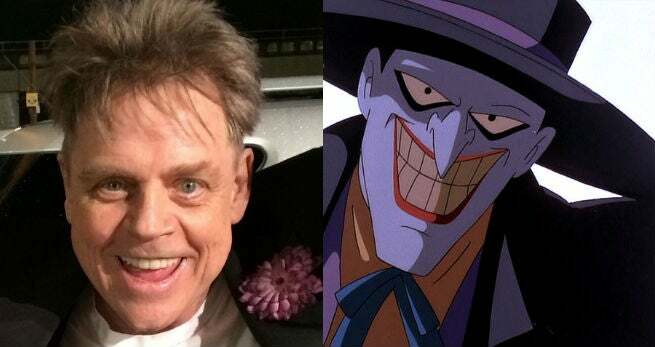 I'm going with the latter. Party on! Oh, what a tangled web we weave When first we practice to deceive! i for one, have no sympathy for JJ. Tell a story without a mystery box. This is Star Wars, mystery boxes do not belong in this genre. Then you won't have to clarify, explain, and deflect about your movie, plot, and characters . A poster on tumblr noted: "she wasn’t even tagged. it was just a hashtag search…"
It's obvious that people are getting phone calls now from Disney lol. @spacebaby45678 wrote: Oh, what a tangled web we weave When first we practice to deceive! This is why it was a fair decision to have JJ do Episode VII and only Episode VII. He's pretty brilliant when it comes to starting conflicts and getting people invested, but he's not so great at coming through with what he's created. Rian Johnson will be able to pick up where he left off seamlessly and without the emphasis on all the big mysteries. JJ's damage control was pretty meaningless, but that's the whole idea I guess. If it was the best thing to do for his NDA I have nothing to say. It was probably out of his hands. Also even though he's clearly doing damage control the wording he uses is really interesting.He says she doesn't discover them not that she finds it who they are which I think is another way in debunking her being a Skywalker without doing it so openly since Rey discoveries Luke meaning he's not her father.It's also impossible for her mother to already be in her world in TFA because the only age appropriate character that could be her mother is Leia and that was already debunked.Seriously even the damage control is lazy and makes no sense. 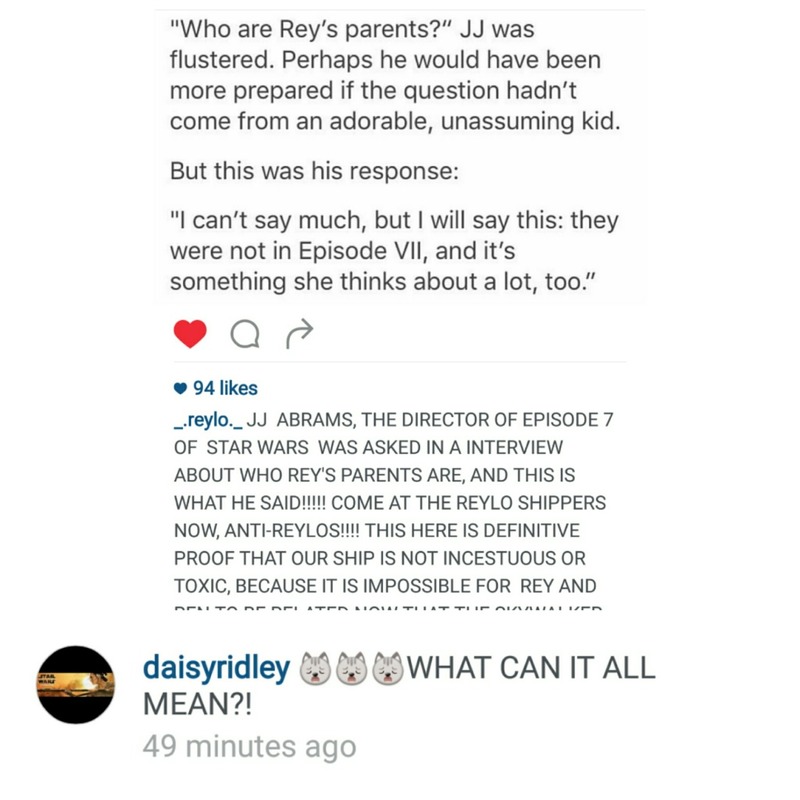 JJ debunks Rey Skywalker... and Daisy's first instinct is to search the Reylo tag!?!?! Guys, told you, this is huge. JJ slipped. badly. DC is failing. Seriously, you know that you expected DC. It's impossible not to do DC when something like this happens. But considering how clumsy they are with it, they know they are f***ed. JJ's oriignal statement at the event is unrefutable. he meant what he meant. Seriously!!! That is quite funny!! !